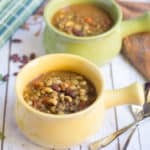 This blog needs no introduction about my love affair with beans and lentils. 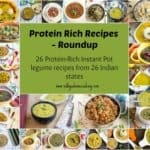 :-) I have over 35 lentil recipes from all over the Indian states. My love for lentils continue, and now it’s time for green lentils and spinach curry aka dal palak. Dal means lentils and palak means spinach in Hindi. Here comes my simple spinach lentils curry spiced with curry powder. The subtle flavor of ginger and the curry powder makes it a perfect accompaniment for pulav too. Last week, I served this with a simple pulav, and the combination was heavenly. We did not miss our raita. More than with roti, I like this dal with plain rice or with jeera rice. 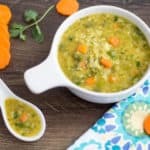 Why Green Lentils? Can we use other lentils for Dal Palak? Oh yes. 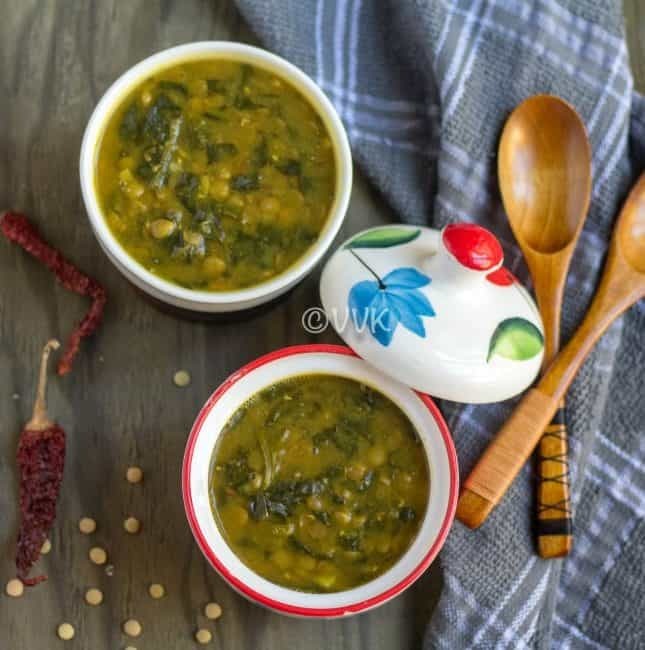 There are different varieties of dal palak, and you can prepare them with yellow moong dal, toor dal, green mung beans, chana dal, masoor dal or even with brown masoor dal. I like the texture of green lentils. It doesn’t become mushy like the other ones, and it stays soft yet firm even after cooking. As we traditionally make the spinach kootu with moong dal, I thought of trying the dal palak with other lentils. Green lentils are one among the common lentils that you can find on all grocery stores here in the US. So I went with that option. I made this in the Instant Pot, but you can make this on the regular stove-top pressure cooker as well. Do the tempering as I mentioned below in a pressure pan or cooker. After adding the lentils, instead of 2 cups of water, add 3 cups of water for the stove-top pressure cooker and cook for four whistles. Green lentils take comparatively more extended time to cook. 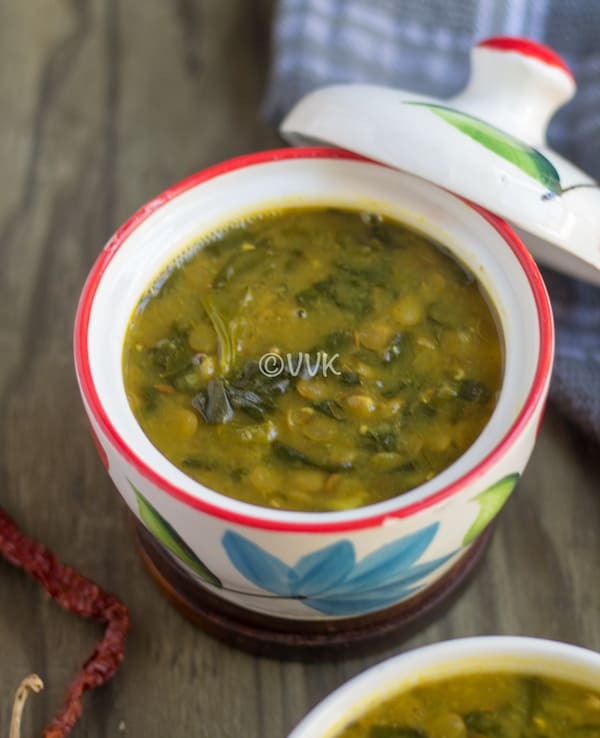 Now without any further ado, here comes the dal palak recipe and the video. Wash the green lentils and set aside. Also, wash the spinach and chop them roughly. Set the Instant Pot in saute mode and when the display shows “HOT,” add the coconut oil. After 30 seconds, add the cumin seeds and finely chopped ginger and saute for 30 to 45 seconds. Add the chopped tomatoes and mix. Then add the chopped spinach and cook for a minute. Now add the salt, turmeric powder, curry powder, and ground pepper and cook 3 minutes. When the spinach wilts, add the green lentils and two cups of water. Mix thoroughly and press the cancel button. Close the Instant Pot lid and make sure the vent is in the sealing position. Press the manual button and set the time to 20 minutes on high pressure. After cooking, allow the pressure to release naturally. Then open the lid and mash the lentils using a potato masher. Mix it and serve hot with rice or any flat-bread. 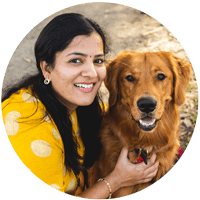 Instead of curry powder, you can use sambar powder or garam masala. I did not include any green chili but went with ground pepper. But you can include green chili as well. You can make this curry with any other lentils like red or brown or yellow ones. As always, adjust the salt and spices according to your preference. You can ignore the curry powder and add more pepper powder to make it a postpartum meal. 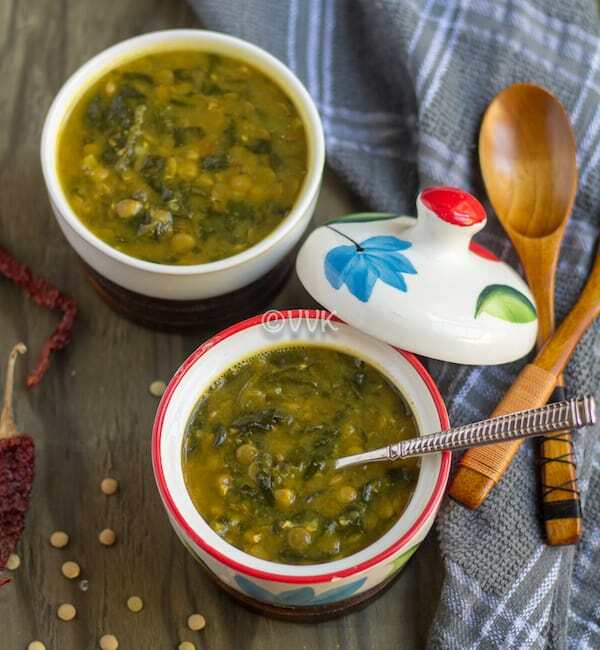 PS: If you try this dal palak, please don’t forget to comment and rate this recipe. Also, please check out my videos and do subscribe to my YouTube channel. Quick one-pot lentils and spinach curry or the Dal Palak made in Instant Pot with green lentils. A perfect gravy for those busy weekdays! Set the Instant Pot in saute mode and when the display shows "HOT," add the coconut oil. Update Notes: This recipe was originally posted in 2014 but now updated with Instant Pot version and with new photos and video. Healthy and tasty comfort food.. 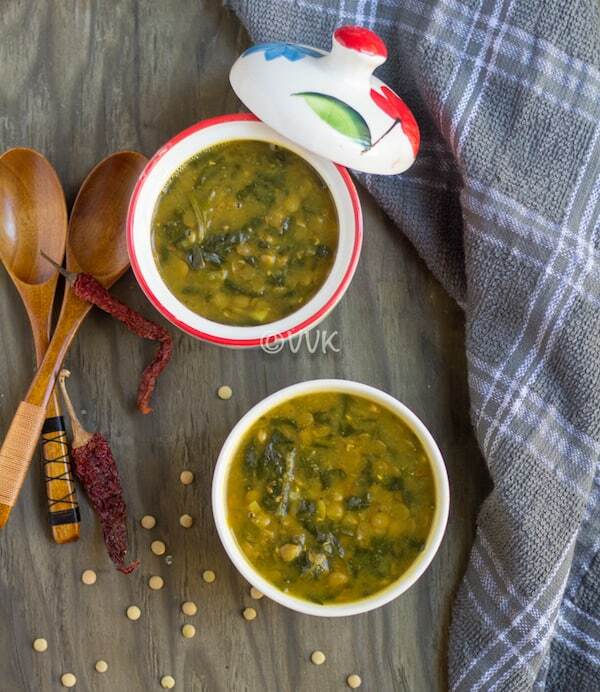 Simple & comforting spinach dal. I cann’t imagine cooking without onion and garlic. Most of my family loves garlic and add ore than required tome chance flavor. Spinach dal looks good, though it is made without onion and garlic. A healthy and yummy dish. Wat a satifying dal palak, nothing can beat this dish. Such an healthy side dish!..thanks for sharing! 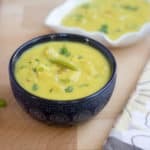 Just love this daal pakal…its like a comfort food. .
Nutrious and easy to make. Nice! Lovely side dish for chapathi.. 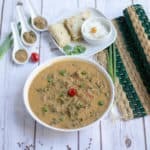 Simple flavorful dal. I usually make it with more liquid. Filling and healthy. True. We love dal paratta. So I usally make it thick in consistency.